In-room kitchens free Wi-Fi a bounty of 24-hour amenities and nearby shopping light the way to the non-smoking Candlewood Suites Grove City - Outlet Center. The three-story Candlewood Suites houses 82 spacious rooms featuring full kitchens free Wi-Fi flat-panel TVs and DVD players. Outside guests can enjoy a relaxing swim in the seasonal heated pool and grill goodies in the barbecue area. Work out around the clock with cardio and yoga equipment plus weights in the fitness room. Additional 24-hour perks include a market a business center and laundry facilities. Parking is free and pets are allowed for a fee. 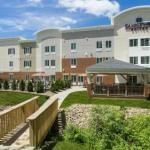 The Candlewood Suites sits off I-79 four miles south of I-80 and eight miles from downtown Mercer. Guests have 130 shopping options at Grove City Premium Outlets a half-mile away. It's a half-hour drive west to reach Hermitage and the Ohio border. The hotel is also 34 miles east of Youngstown - Warren Regional Airport and 60 miles north of Pittsburgh International Airport.